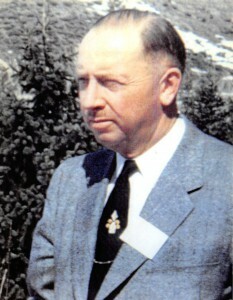 The firm’s founder, Alfred (“Al”) M. Pence (J.D. ’29), began practicing law upon graduation from the University of Wyoming College of Law, first as a city attorney, notably shutting down the last of Laramie’s brothels, and then going on to a lifetime career as a litigator. He was a litigator up until the day he died—he passed away in 1980 and had a jury trial the week prior to his death. Al also served in the Army during WWII and retired as a Lieutenant Colonel. UW presented him with the Distinguished Alumni Award in 1977. Al and his wife, Mary Lou, a local historian and author, were great supporters of the community. 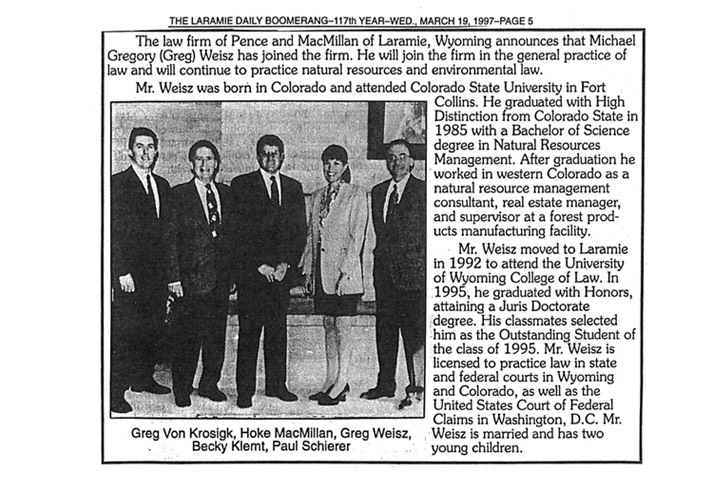 In 1945, the firm was formed; thus began the proud and established tradition of Pence and MacMillan: Wyoming attorneys since 1945. Following the Second World War, George J. Millet (J.D. 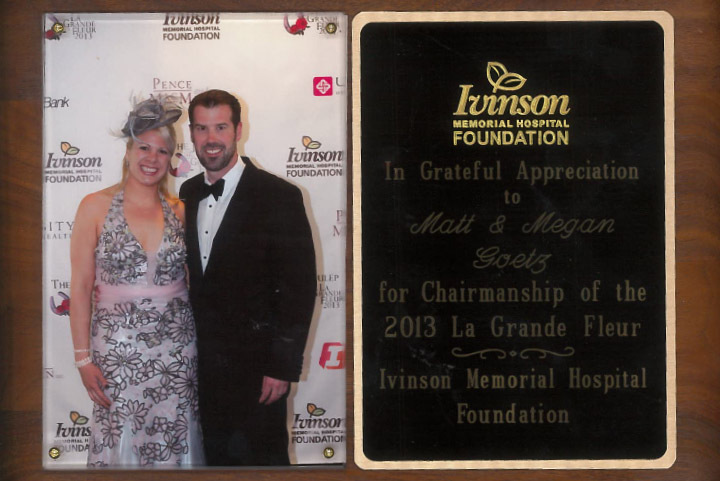 ’37), a star transactional attorney, joined Al Pence and the two founded Pence and Millet. Hoke M. MacMillan (B.S. ’67, J.D. 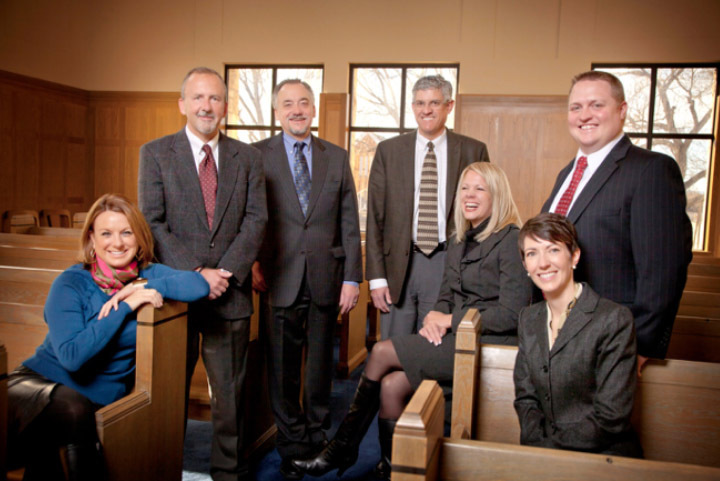 ’70) joined the firm in 1974, and in 1982, Hoke joined Al as senior member and the firm became Pence and MacMillan. Several top Laramie attorneys passed through the doors of the firm, including Arthur T. Hanscum (B.S. ’72, J.D. ’75). Hanscum later went on to serve as a district court judge in Laramie and is now retired in Florida. Hoke came to know Al while Hoke was a law student at UW. At that time, law students were heavily involved with the student government leadership on the main campus. That was the case with Hoke—while in law school, he also served as president of the student body, a position which also made him an ex-officio non-voting member of the Board of Trustees. As Hoke says, “As an ex-officio member, you were in good company because the other ex-officio members include the Governor of Wyoming, the President of the University and the Superintendent of Public Instruction.” It was while he was serving in that capacity that he met Al Pence, who was a Trustee. 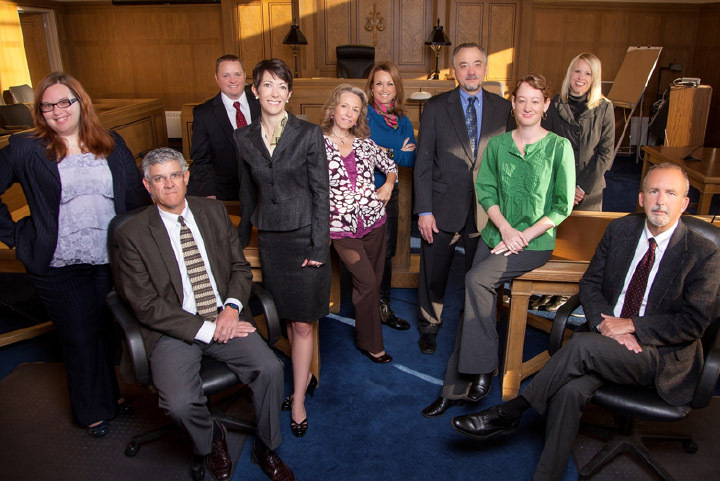 The Pence and MacMillan law firm continues to this day, with Cheyenne and Laramie attorneys providing the best established legal representation in the state of Wyoming. 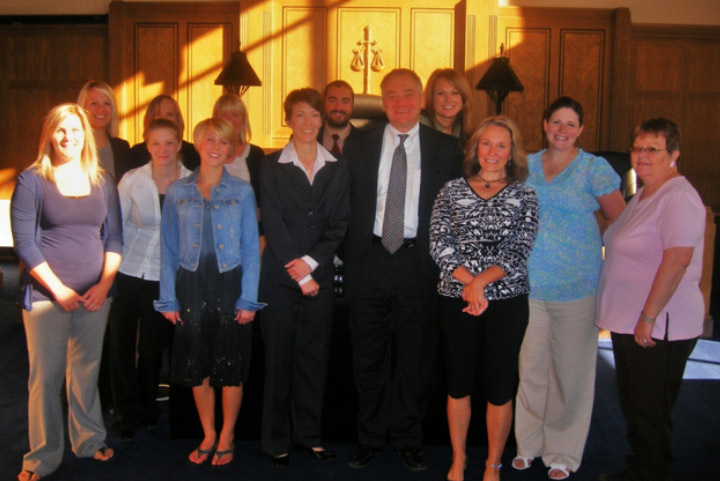 2012 Staff and Attorney Group Picture: Sarah Johnson, Greg Weisz (sitting), back – Dustin Richards, Jodi Shea, Jeannie Czech, Devon O’Connell, Paul Schierer, Susan Horan, Megan Overmann Goetz and Robert Southard sitting in front. Dream Team Guest-House were the winners of the Jim Cavalli Service to Others Award. 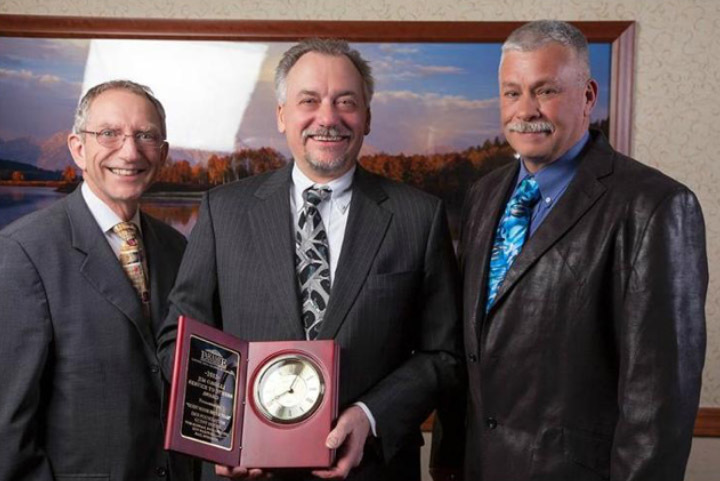 Left-Right: Tom Mangan- First Interstate Bank, Paul Shierer- Pence and MacMillan, LLC, and Guy Warpness- WyoTech. Not Picture- Paul Greaser- ACRE Co. Photo by Brian Harrington, BHPimaging. Some of you may remember “The Becky Klemt” letter, which Becky wrote in 1988. In the words of our time, her letter “went viral.” The letter led to an article, “A Lady Lawyer in Laramie Writes a Landmark Letter,” which appeared in the Wall Street Journal on Sept. 6, 1990. Becky even appeared on the Tonight Show with Johnny Carson on October 3, 1990. 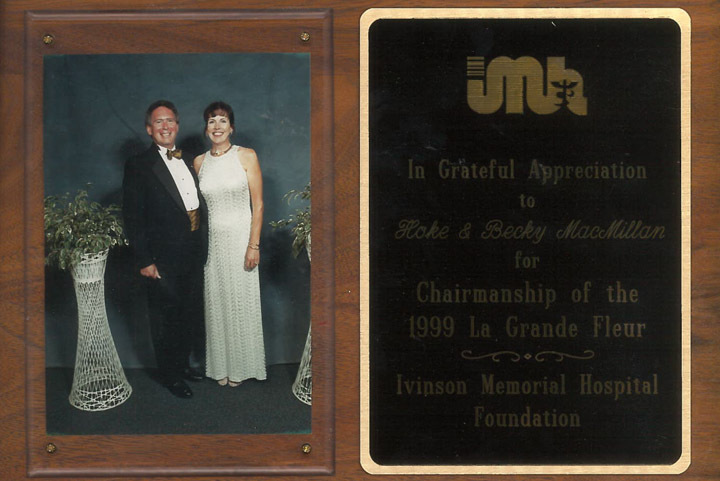 It all started on July 19, 1988, when Becky wrote a letter to an attorney in California asking for assistance in collecting a judgment. I am in receipt of your letter to me dated August 8, 1988, regarding collection of a judgment against Stephen Broomell.Steve, I’ve got news—you can’t say you charge a $100,000.00 retainer fee and an additional $1,000.00 an hour without sounding pretentious. It just can’t be done. Especially when you’re writing to someone in Laramie, Wyoming where you’re considered pretentious if you wear socks to Court or drive anything fancier than a Ford Bronco. Hell, Steve, all the lawyers in Laramie, put together, don’t charge $1,000.00 an hour. Anyway, we were sitting around the office discussing your letter and decided that you had a good thing going. We doubt we could get away with charging $1,000.00 an hour in Laramie (where people are more inclined to barter with livestock than pay in cash), but we do believe we could join you in California, where evidently people can get away with just about anything. Therefore, the four lawyers in our firm intend to join you in the practice of international trade and geopolitical relations between the Middle East and Europe. Now, Steve, you’re probably thinking that we don’t know anything about the Middle East and Europe, but I think you’ll be pleasantly surprised to find that this is not the case. Paul Schierer is actually from the Middle East—he was raised outside of Chicago, Illinois, and although those national newsmen insist on calling Illinois the Midwest, to us, if it’s between New York and the Missouri River, it’s the Middle East. Additionally, although I have never personally been to Europe myself, my sister just returned from a vacation there and told me lots about, so I believe I would be of some help to you on that end of the negotiations. Hoke MacMillan has actually been there, although it was 15 years ago, so you might have to update him on recent geopolitical developments. Also, Hoke has applied to the Rotary Foreign Exchange Student Program for a 16-yearold Swedish girl and believes she will been helpful in preparing him for trips abroad. Another thing you should know, Steve, is that the firm has an extensive foreign language background, which I believe would be useful to you. Hoke took Latin in high school, although he hasn’t used it much inasmuch as he did not become a pharmacist or a priest. Vonnie Nagel took high school German, while Paul has eaten in Italian restaurants. I, myself, majored in French in college, until I realized that probably wasn’t the smartest career move in the world. I’ve forgotten such words as “international” and “geopolitical” (which I’m not too familiar with in English), but I can still hail a taxi or find a restroom, which might come in handy. Steve, let us know when we should join you in California so that we can begin doing whatever it is you do. In anticipation of our move, we’ve all been practicing trying to say we charge $1,000.00 an hour with a straight face, but so far, we haven’t been able to do it. I suspect it’ll be easier once we actually reach California where I understand they charge $5,000,000 for one-bedroom condos and everybody (even poor people) drive Mercedes. Anyway, because I’ll be new to the area of international trade and geopolitical relations, I’m thinking of only charging $500-$600 an hour to begin with. Will that be enough to meet our overhead? I look forward to hearing from you before you go away again for six weeks. P.S. Incidentally, we have advised our client of your hourly rate. 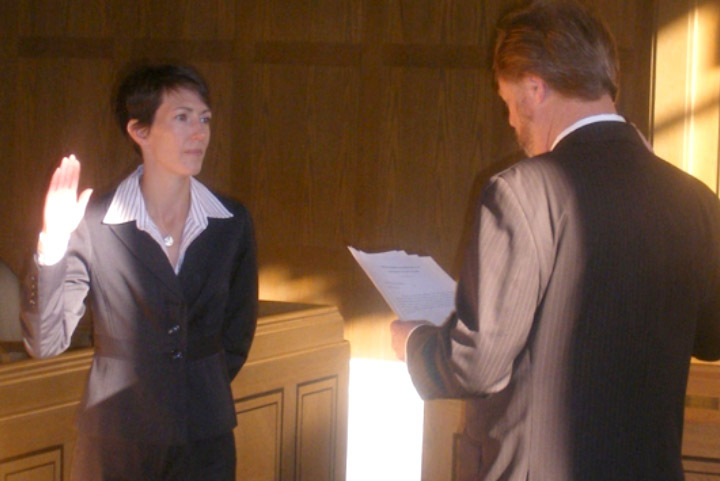 She is willing to pay you $1,000.00 per hour to collect this judgment provided it doesn’t take you more than four seconds. 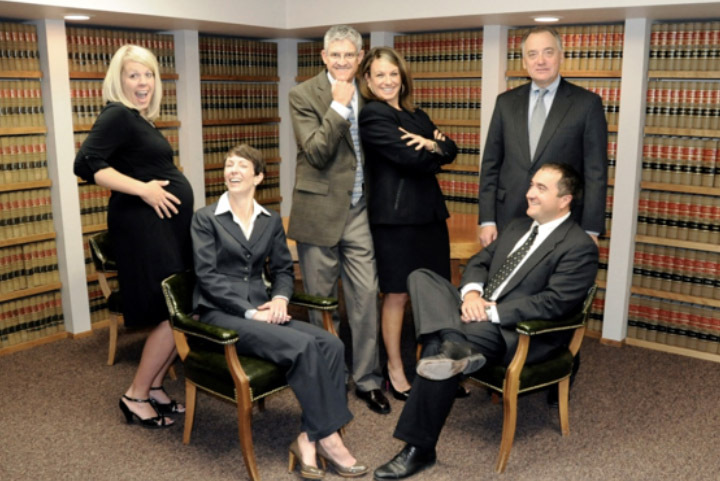 Becky’s wit and sense of humor are indicative of the attorneys at Pence and MacMillan.